^ Robehmed, Natalie. 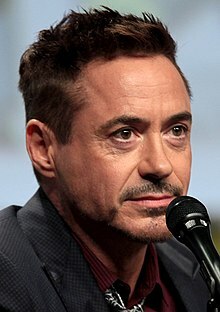 "The World's Highest-Paid Actors 2015: Robert Downey Jr. Leads With $80 Million Haul". forbes.com. Forbes Magazine. Retrieved 4 August 2015. 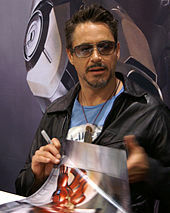 ^ "Robert Downey, Jr". Off Camera with Sam Jones. 6 February 2014. Retrieved 20 November 2018. ^ Pretty in Pink (Special feature "Zoids and Richies"). John Hughes. Paramount Home Entertainment. 2002 . B00006JY0R. 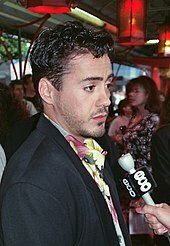 ^ Ebert, Roger (24 April 1998). "TWO GIRLS AND A GUY". RogerEbert.com. Chicago Sun-Times. ^ Harris, Paul (14 April 2007). "So Who Was the Zodiac Killer?". The Guardian. Retrieved 2 September 2014.